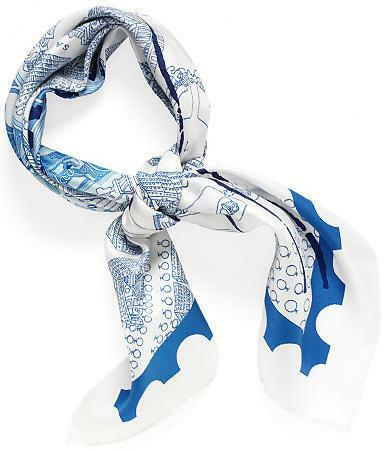 With the West's rediscovery of Russia (and the latter's rising prominance), Hermes has dedicated a scarf to the architectural treasures of the Western's "East", with a particular focus on Moscow. This design has been launched during the Fall/Winter 2008 collection and represents yet another departure from the previous concepts. 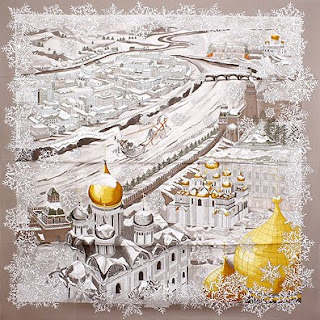 It depicts, in picture-clear images, a horse-drawn sleigh wisking its passangers through the snow-covered Moscow streets. The novelty of this design is rendered by the winter theme, the snow flakes all along the border and the travellers' clear path that allows the audience to imagine what enchanting views the trip may uncover - indeed, a dreamers' paradise. The churches' golden domes - perhaps a symbol of glorious divinity - add both substance and impact in an otherwise serene scene. Dreamers of far-away lands were treated to another surprise in 2007, a visit through Tokyo. I am particularly excited about this design as I have had the privilege of not only experiencing first-hand the city, but also immersing myself in it and living every moment in Tokyo fully. The previous stamp-like design has been abandoned in favour of a postcard-like illustration of the enchanting buildings, slim skyscrapers that spruce vigorously towards the sky and make for an urban "labyrinth" - artfully depicted in the design. In the upper right corner the visitor can identify the Hermes boutique in Ginza, with its horse rider (affectionately called "l'artificier") atop flying two of the Maison's flags (typically designs of the current scarf collection). Of particular interest is the way the design allows for a spectacular knot, with the vertical banner prominently displaying right on top of the knot. 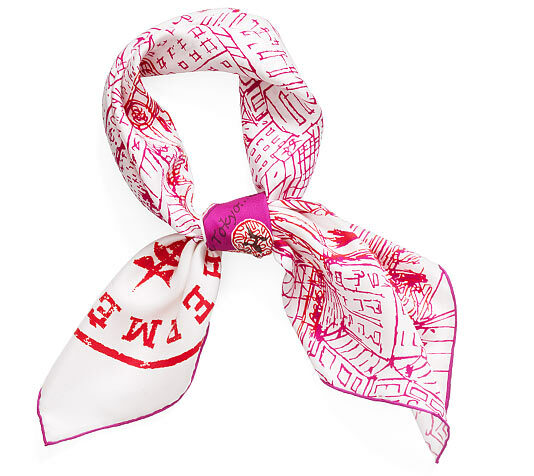 The design, overall, is very stirring and engaging, and when knotted, the scarf displays very architecturally - a definite contemporary design for daring beauty-lovers. P.S. 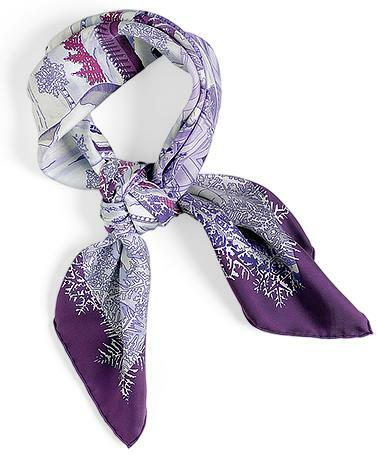 I recently saw a very similar design, called "de passage à Ginza", which I suspect is a limited-edition scarf designed exclusively for the Ginza boutique. Following the success of the "visit to Paris" design the year before, and as a way to commemorate the opening of the Wall Street boutique in 2007, Hermès launched "De Passage à New York". The postal stamp shape is featured again, while the image illustrates a partial map of Manhattan with the various boroughs spelled out on the side. What's novel about this design is the way the image was conceived, to give the sensation of perpetual motion, with an apparent second image superimposed on the first. Unlike the previous, "Paris" design, this one features "hand-drawn" lines, further adding to the appearance of motion. As was the case with several other scarf designs, I find this one a little too "geometric" when knotted, so it may not be too appealing to those who prefer either more traditional, organic or subdued impact from their scarves. August - the calendar month named after Julius Caesar's adopted son Augustus, emperor of the first Roman Empire and intended to mark Cleopatra's birth month - is a time when I become aware that summer is coming to an end. In anticipation of the colder seasons, I contemplate, one more time, a quick getaway to the shores of the sea. The vacation mood inspired me to focus my attention to the travel series issued by Hermes, which I'm all too eager to present. In 2006, Hermès commissioned a scarf design to evoke the traveling theme, and Nathalie Vialars - a designer -embarked on a multi-year journey through great metropoleis of the world. So the first featured "destination" was none other than Paris, the City of Lights. 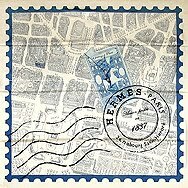 The witty design replicates a (perhaps collectible) stamp - a universal symbol of traveling - that illustrates part of the map of the "Quartier des Tuileries" (the Tuileries District) and extends several blocks North, just beyond La Madeleine. Of interest is to identify the historic reference points of the City, such as "la Place de la Concorde" ("Friendship Square"), "Les Jardins des Tuileries" to the right (the "Tuileries Gardens" in front of the Louvre), the "Place Vendôme" North of the gardens and finally "La Madeleine", a Greek temple in the heart of the city and the only Christian church not to feature a cross. Of course, as the gaze covers the rest of the "map", you cannot avoid a highlighted corner of a building, which most connaisseurs would instantly recognize as the site of the world-famous Maison Hermès, on 24, rue du Foubourg St.-Honoré. 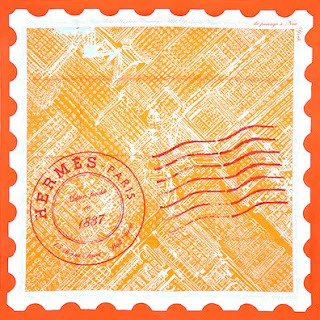 The design also features the rider (affectionately called "l'artificier") atop the Hermès boutique as an added stamp, and is further enhanced by an authentic-look-alike "ink-stamped" mark. Of particular note is the very accurate depiction of buildings, unlike - as we'll soon discover - the following design issues. A very ingenious design, indeed, and a definite asset for all tourists who appreciate those items that are both aesthetically-pleasing and quite practical. We meet people from all walks of life. Some people walk into our lives and stay there for good, a few will touch our lives in profound and meaningful ways, yet others walk out of our lives never to return. It's really up to us to receive the gift that they bring us, to seize the opportunity to grow thanks to them, and to cherish the beings that we become as a result of their impact. And so it is that today I'm embarking on a series of posts dedicated to people whom I had the privilege to meet and who have had a profound influence on me - those who, no matter where they are, are always part of who I am and who I've become. 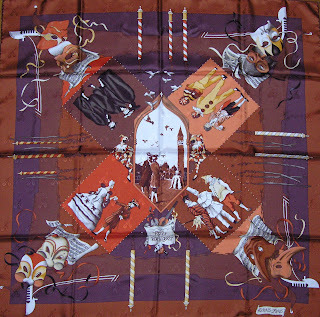 Today's post features this truly magnificent scarf, entitled "Fetes Venitiennes" ("Venetian Feasts"). Its regal appearance is obvious not only from the rich colours (suggestive of chocolate, or even of a lush treasure), but also from the material itself - the famous "Jacquard" silk - named after the inventor of the weaving loom (also named after him) that allows the creation of distinct patterns within the fabric during the weaving process. 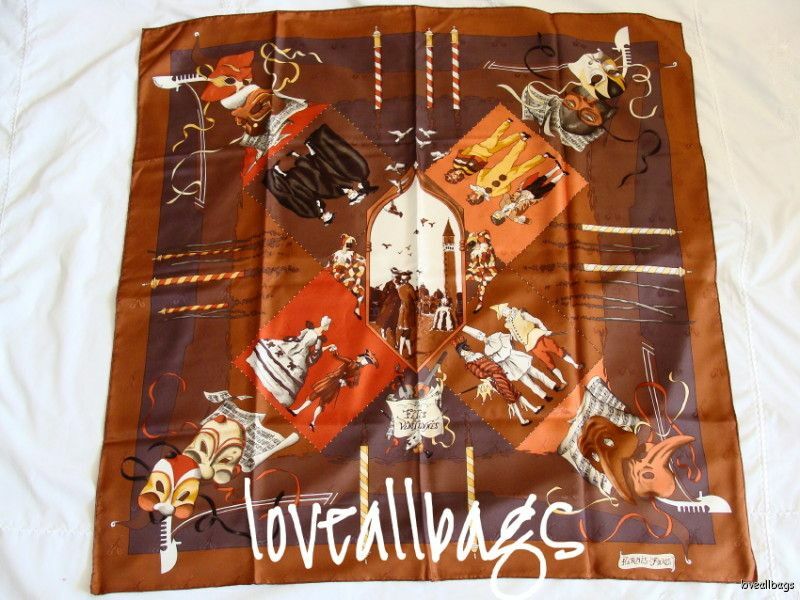 The process adds significant costs to the manufacturing, and Hermes has realized this technique became prohibitively expensive even for the discriminating customers, so it stopped production and with this decision, all scarves printed on Jacquard silk became even greater rarities. The topic, in itself - the Carnival of Venice - is brought to life by Hubert de Watrigant, a renowned artist who created many other designs for the House. It evokes people's celebration of this annual traditional event, some dressed up in costumes, as well as the admirers' appreciation for the Venetian masks (another symbol of the carnival). And I'm thrilled at the opportunity to link this scarf to one of my dearest friends who has enriched my life beyond her wildest imagination and who continues to be a source of great inspiration and drive for me, and an exceptional role model. So through this scarf, her presence will always be with me - to guide me and to provide comfort to me. 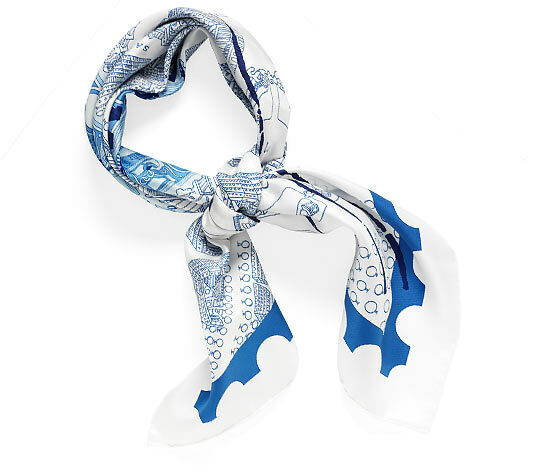 Because just like this scarf, our friendship is rich, profound and very meaningful - and, above all, she's as regal distinguished and rare as the Venetian Feasts !